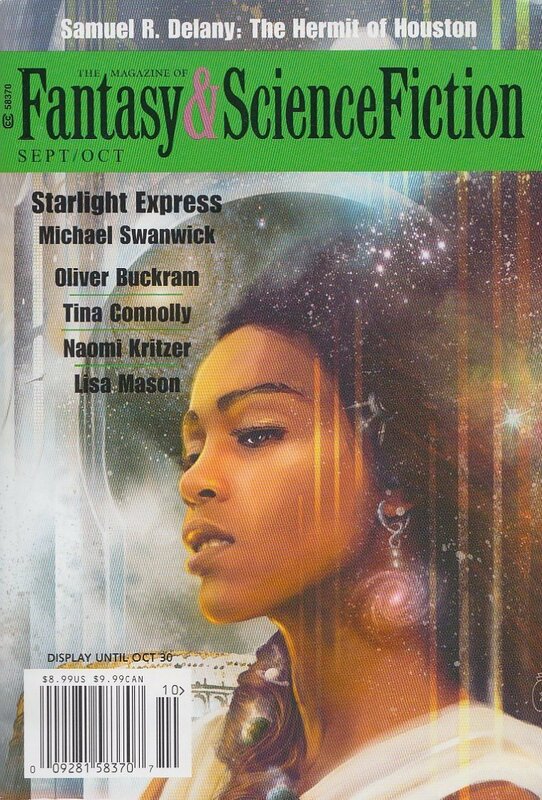 "Starlight Express," by Michael Swanwick [bio] (edited by C.C. Finlay), appeared in Magazine of Fantasy & Science Fiction issue 09-10|17, published on September 1, 2017 by Spilogale Inc. Pro: Szette was an accidental creation, born of the transmitter, so it’s no surprise that she chooses to end her life by returning to it. The desperation of her situation comes though loud and clear. Con: Why did they delay so long in telling Szette what her history was? Why didn’t she figure out for herself how far in the future she was? Flaminio is little more than a puppet. His actions are compelled by the bracelet. It’s hard to believe that in 10,000 years people will still be visiting the Pantheon and the Colosseum and speaking Italian. Or that Earth will have three moons. What a sad future. Favorite character was the Great Albino. Loved the cover art inspired by the story though.